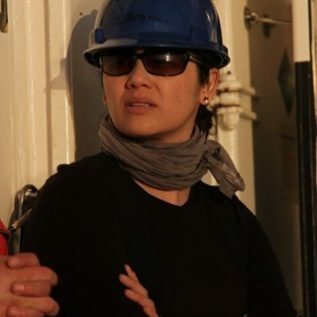 Dr Silvana Birchenough Senior Marine Ecologist and Group Manager for Advice & Assessment at Cefas, and co-investigator in the EISPAC project. Silvana obtained her PhD from the University of Newcastle upon Tyne, UK in 2003. She has 15 years of post-doctoral experience in marine ecology. She is a researcher and scientific advisor on issues related to ecology and human activities. She works on understanding of long-term benthic changes resulting from climate change and ocean acidification. Recently, her work has been targeted to understand the potential impacts of multiple-stressors (e.g. temperature, pH changes and metals) on commercial species, generating science-evidence of these expected effects under a changing climate. Her research is also in relation to in situ observations (i.e. Sediment Profile Imagery camera-SPI) for studying processes and function of benthic infauna following disturbance events. This work helps to develop indicators of seabed Integrity (D6) in support EU MSFD work to improve monitoring. Silvana is an active publisher and a reviewer for many scientific journals including Nature Scientific Reports, PLoS ONE, Marine Pollution Bulletin, ICES Journal of Marine Science, Biogeociences and Marine Ecology Progress Series. Silvana has led a number of national and international funded projects helping to tackle science problems, promoting networking and innovative scientific developments. Silvana co-chaired the ICES study group on Climate related benthic processes in the North Sea (SGCBNS). She chairs the ICES Benthic Ecology Working group (BEWG) and she is an active contributor on the Working Group on Marine Benthal Renewable Energy (WGMBRED). She represents Cefas at the Healthy & Biologically Diverse Seas Evidence Group (HBDSEG) benthic-subgroup. She is a member of the Scientific Steering Committee for the North Sea Conference 2016 and a Senior advisor of the Chilean Project “Multiple stressors and socio economic indicators in commercial species”- mussels). Silvana is also a Fellow of the Winston Churchill Travel Foundation for her dedicated research on benthic ecosystems with the SPI camera.